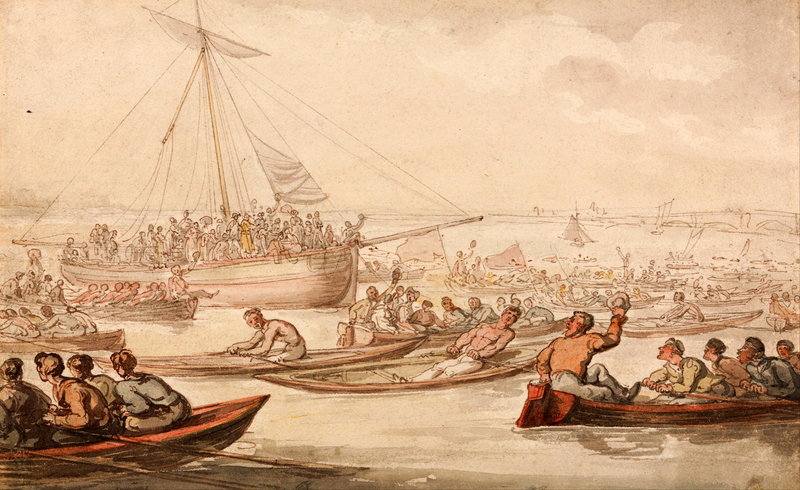 A view of the 91st Doggett’s Coat and Badge Race in 1805 by the Georgian caricaturist Thomas Rowlandson. 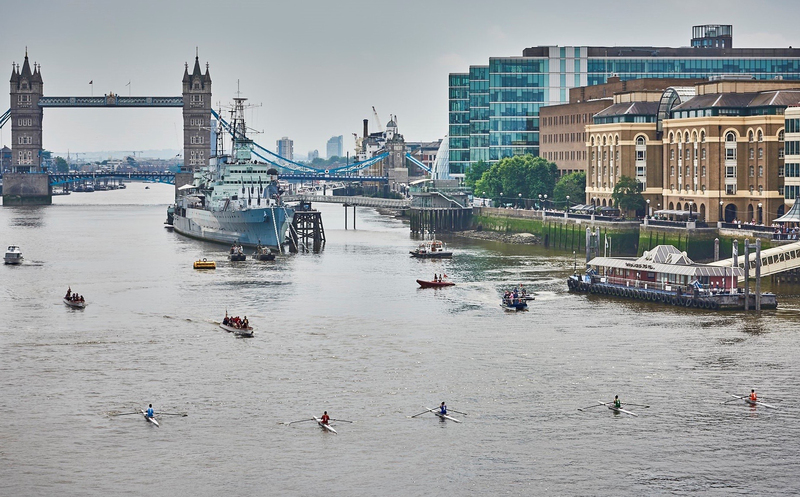 The world’s oldest existing continuously run rowing race, ‘Doggett’s’ was instituted in 1715 by Thomas Doggett as a race for up to six men who had just finished the long apprenticeship to be allowed to carry goods and/or people on the River Thames. 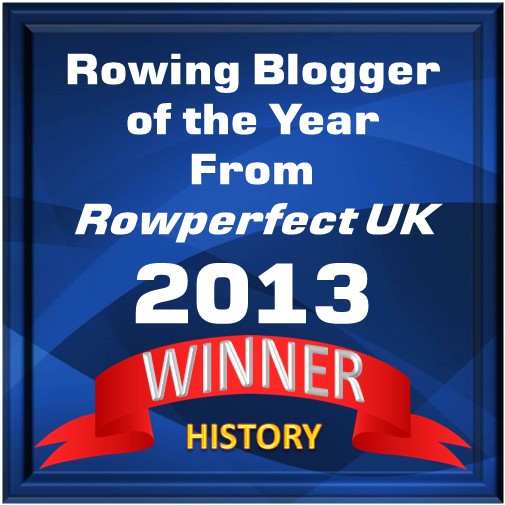 The prize then and now is a splendid ‘Coat and Badge’ – and a lifetime’s recognition as a Doggett’s winner. 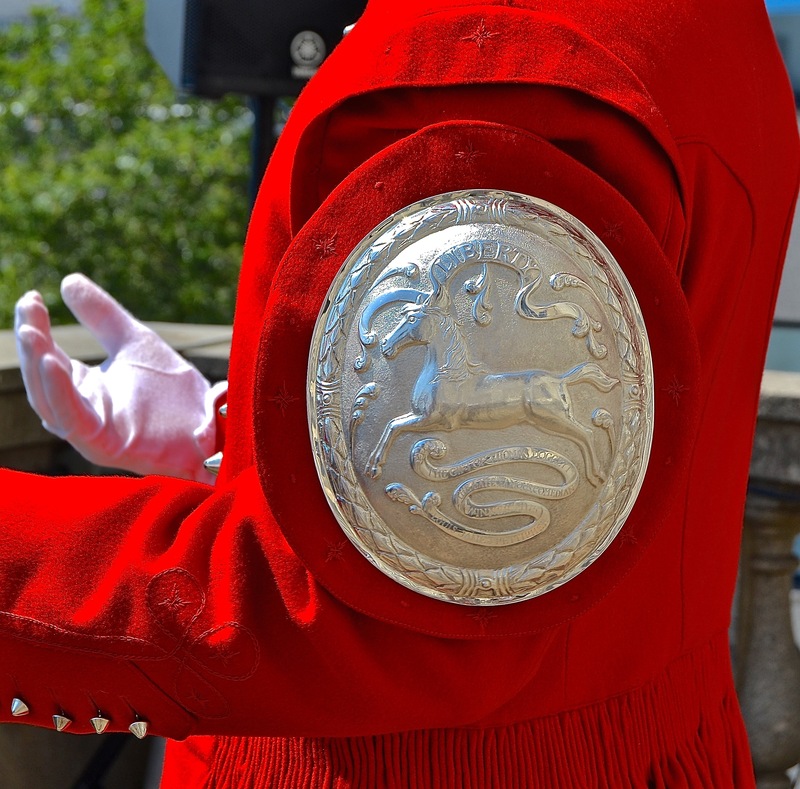 Tim Koch previews the 304th Doggett’s Coat and Badge Wager. When Thomas Doggett instituted his eponymous race in celebration of the accession of George I to the throne of Great Britain and Ireland, he stated that it was to be held ‘on the first day of August forever’. Three hundred and three years later, the ‘forever’ part is holding true to the founder’s wishes – but the date has proved to be something of a movable feast. The Coat and Badge – ‘forever’. Originally, Doggett’s was raced against the falling or ‘ebb’ tide, but since 1873 it has been run with the incoming or ‘flood’ tide. In the 158 years before 1873, there were only 15 occasions when the race was not held on 1 August, ranging from 2 August in 1729, 1824 and 1852, to 14 August in 1807. It would be reasonable to expect that the 1873 change required the date to be a little more flexible in order to race at a reasonable time coinciding with the flood tide, but, between 1873 and 1895, there were only seven Doggett’s not held on the first day of August. It was only after 1896 that most races were run at a convenient day at the end of July and, in the last 30 years, it has been common to race in the second or third week of July. 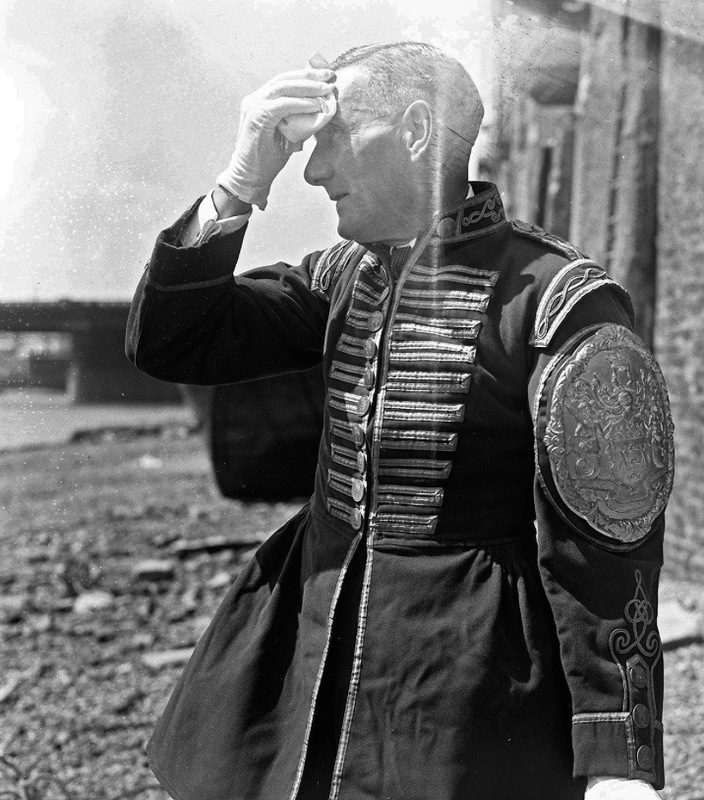 The last time that the Coat and Badge was raced for as Thomas Doggett required, on 1 August, was in 2015 – with 1928 the last year before that. Despite these variations, it may come as a surprise that the 2018 Doggett’s will be held on 4 September. The start of the 2016 race. The reason for this late date is that the 2018 race is coming under the umbrella of the Totally Thames Festival, which runs between 1 and 30 of September. (Doggett’s) will be part of Totally Thames’ annual season of over 100 events that celebrate the River Thames and the heritage of our river and which illuminate the long-standing traditions and unique stories that the Thames holds. As part of Totally Thames 2018, the traditions and stories of the (Doggett’s Coat and Badge) will be explored through a series of outdoor exhibitions. 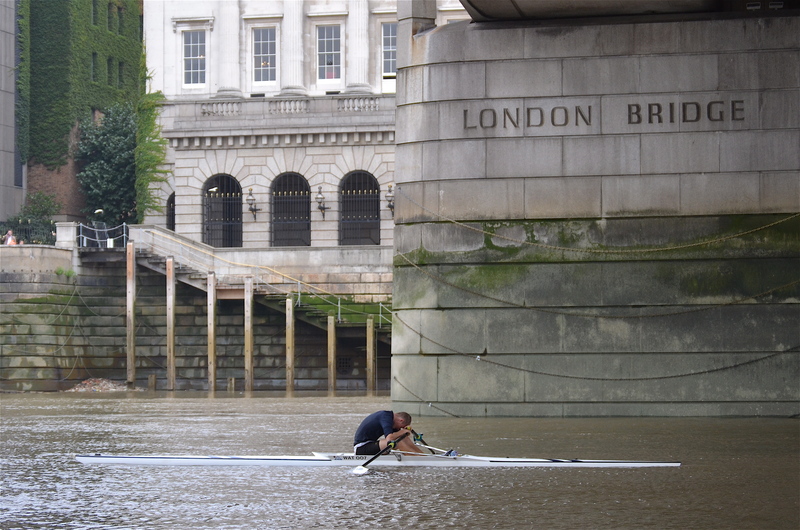 Using recorded oral histories, photographic portraits, and 100 years of archive material made publicly accessible for the first time, ‘The World’s Oldest Boat Race’ exhibition brings to life this hidden history at the heart of London. 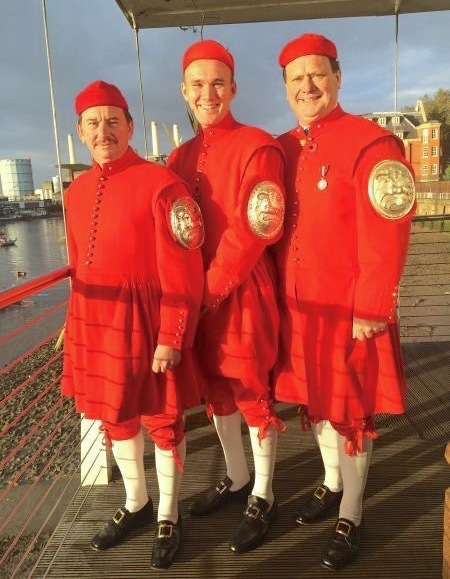 This project is delivered in partnership with London Metropolitan Archives, The Worshipful Company of Fishmongers’ and The Company of Watermen and Lightermen. 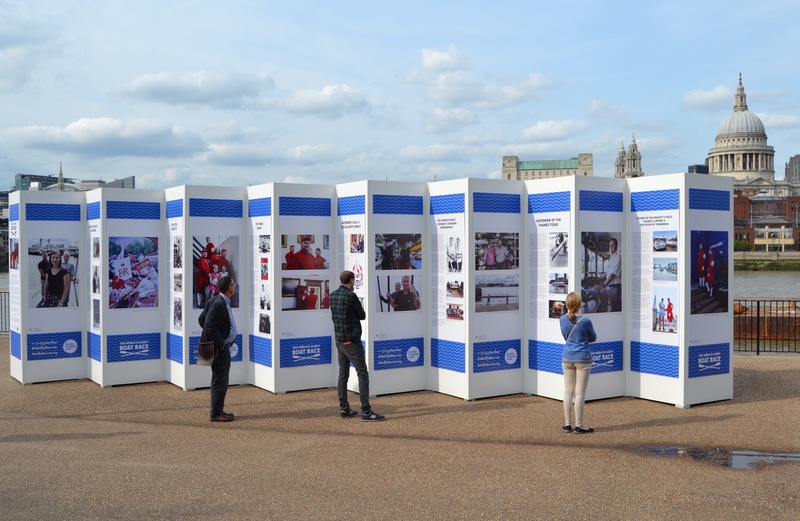 ‘The World’s Oldest Boat Race’ exhibition on London’s South Bank. There will be more about this on HTBS tomorrow. The later date for the 2018 Doggett’s has upset some traditionalists, and, holding the race up to six weeks later than it may otherwise have been, will not increase the chance of decent weather on the day. However, these factors aside, this year’s Doggett’s should appear no different from any other held in modern times. Fascinating interviews with 15 Doggett’s winners and competitors from 1964 onwards are available as audio files and as transcripts on the Totally Thames website. I would have edited them to make them more accessible to the general listener or reader, but ‘HTBS Types’ may appreciate the detail. Fishmongers’ Bargemaster Harry Phelps found it hot work when he umpired the 1948 Doggett’s on 26 July of that year. This year, the competitors are Alfie Anderson, 23, representing the Poplar, Blackwall and District Rowing Club, and George McCarthy, 24, competing for Globe Rowing Club. It is unusual to have only two people racing. In the last 30 years, there have been 10 races with six competitors, five races with five, 11 races with four, and four races with three. The last time only two men raced was 1974, and before that, 1948 and 1938. This year, three other young men coming to the end of their apprenticeship had wanted to enter, but none could finish their final exams in time. However, it is good to know that there should be at least a trio of new competitors for Doggett’s 2019, particularly as neither of this year’s contenders will be eligible – both are on their third and final attempt. To those who suggest that having only two entrants is the beginning of the end for Doggett’s, I would echo Mark Twain: ‘The report of my death was an exaggeration’. Alfie Anderson on finishing his apprenticeship and gaining his freedom in 2016. Alfie Anderson is an unusual contestant in that he already has a Coat and Badge, albeit one in claret, not scarlet. He got it for winning the special 2014 race held in addition to Doggett’s to mark the 500 years since an Act of 1514 regulated fares charged by those working the Thames. 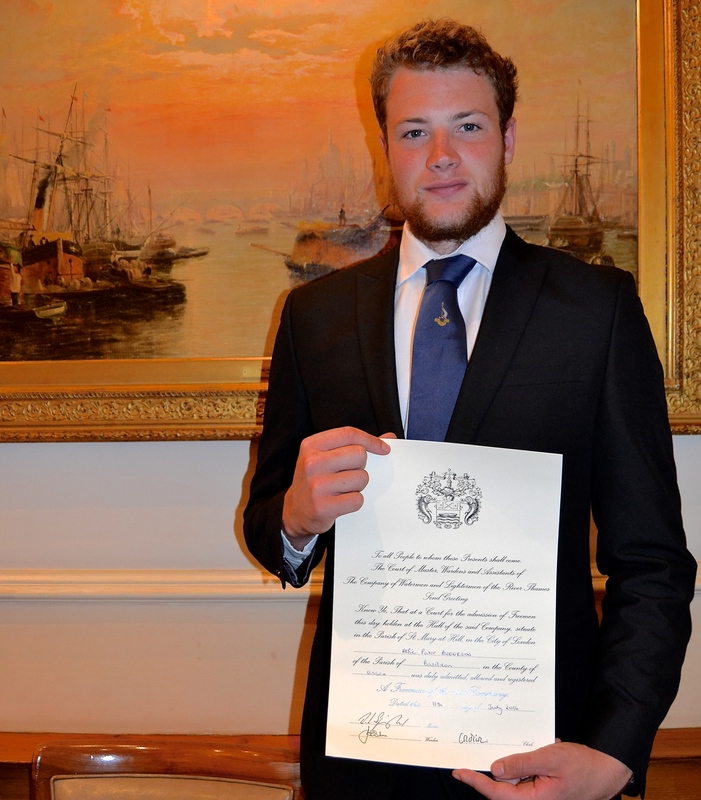 He beat five other scullers, taking the lead in the last minute with an exhausting final burst, his training at London Rowing Club and his experience from rowing since the age of 14 clearly paying off. I noted at the time that he was obviously a strong contender for Doggett’s in 2016 (the first year in which he would be eligible to race). As it turned out, he lost a lot of fitness in the intervening years and came second in both 2016 and 2017. I look forward to seeing what shape he is in for his final attempt. Anderson at the finish of the ‘500’ Coat and Badge Race. 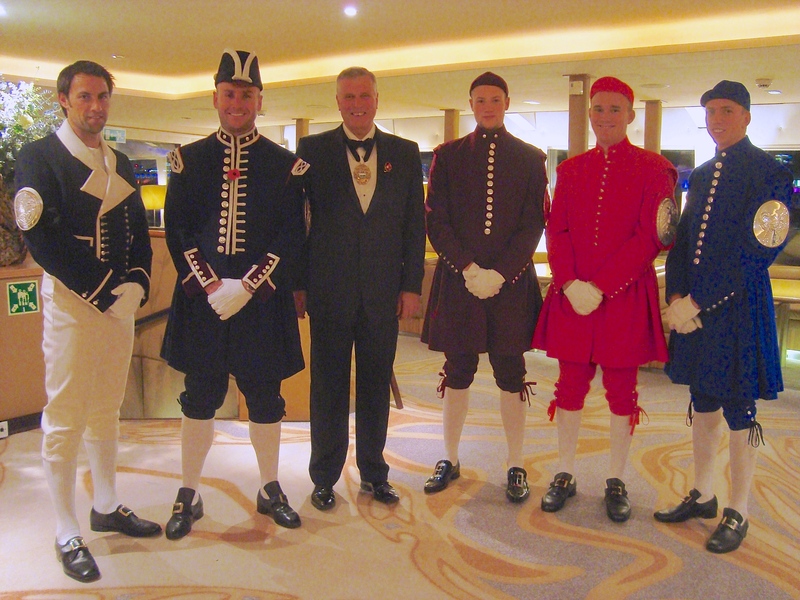 Alfie Anderson (4th from left) in his ‘500’ claret coat in 2014. 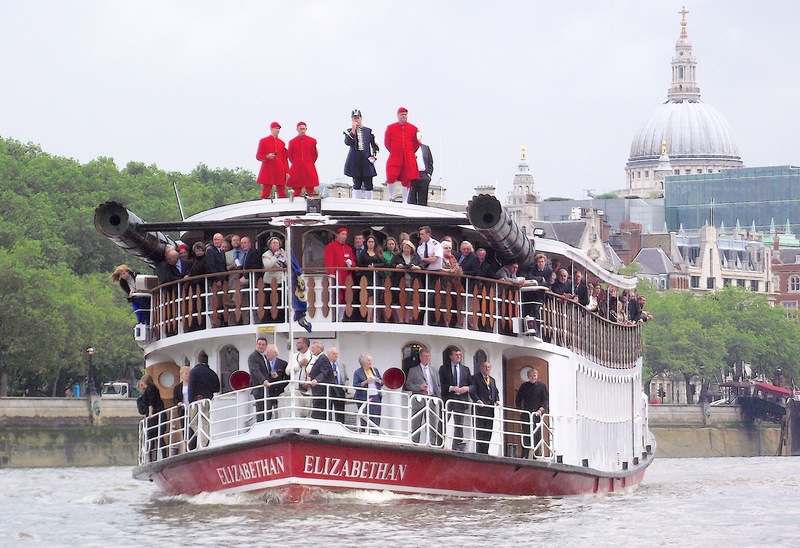 The others are, from left to right, Mark Hunter in the Millennium Coat and Badge, Scott Neicho in the Waterman’s Bargemaster’s livery, Jeremy Randall (then Master of the Company), Alfie Anderson, Harry McCarthy winner of the 2014 Doggett’s and Chris Anness in the 2012 Queen’s Diamond Jubilee race prize coat and badge. Picture: Susan Fenwick. 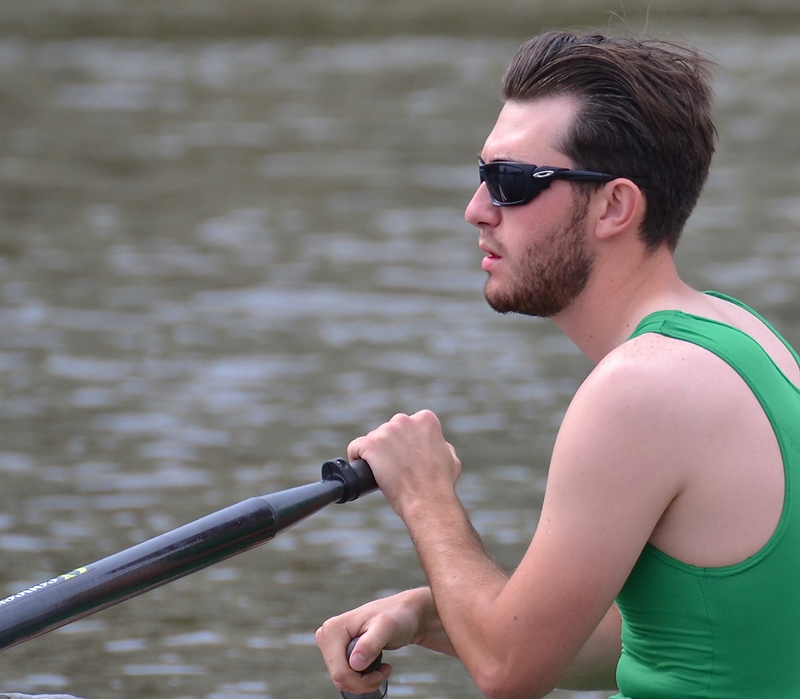 George McCarthy has finished behind Alfie Anderson in both of their attempts at Doggett’s, but I hear that he has been training hard and that he is in good form. He also has the advantage of having three Doggett’s winners in his family to give advice and encouragement. 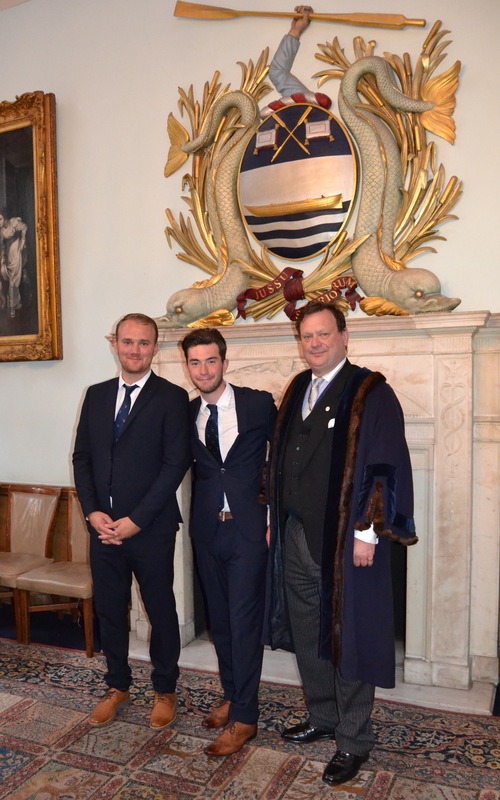 George McCarthy (centre) gaining his freedom at Waterman’s Hall in 2016. His cousin, Harry, is on the left and his uncle, Simon (in the robes of the Junior Warden), is on the right. Left to right: Jeremy McCarthy (won Doggett’s in 1992), Harry McCarthy (won 2014), and Simon McCarthy (won 1984). Picture: Simon McCarthy. George McCarthy at the 2016 Doggett’s. Logically, the bigger and more experienced Anderson should be the favourite, but a lot can happen over 7,400 metres of unsettled and unsuitable water containing washes, bends and currents, plus the potential to hit any of 14 bridges and numerous other unyielding objects. When racing Doggett’s, you are always only one stroke away from disaster and I, for one, will not be placing any bets on who will be the 304th man to wear a Doggett’s Coat and Badge. The start of the 1910 Doggett’s. Sadly, stake boats are not used these days. The eventual winner, Richard Pocock, is shown in the insert. He built the boat in which he rowed. Riverside Walkway, Queens Walk, London SE1 (by the Millennium Bridge), Saturday, 18 August- Sunday, 30 September. Guildhall Yard, Gresham St, London EC2, Saturday, 8 – Monday, 24 September. Aboard the catamaran, Tornado Clipper, Tuesday, 28 – Saturday, 30 September. Also, on Saturday, 22 September at 1.30, there is a boat trip through Central London with an onboard talk by Doggett’s winners Sean Collins and Simon McCarthy. Winners of the Coat and Badge are entitled to a good viewing point on top of the boat chartered by the Watermen’s Company to follow the race. Those left on land can choose where they view Doggett’s using the map below. 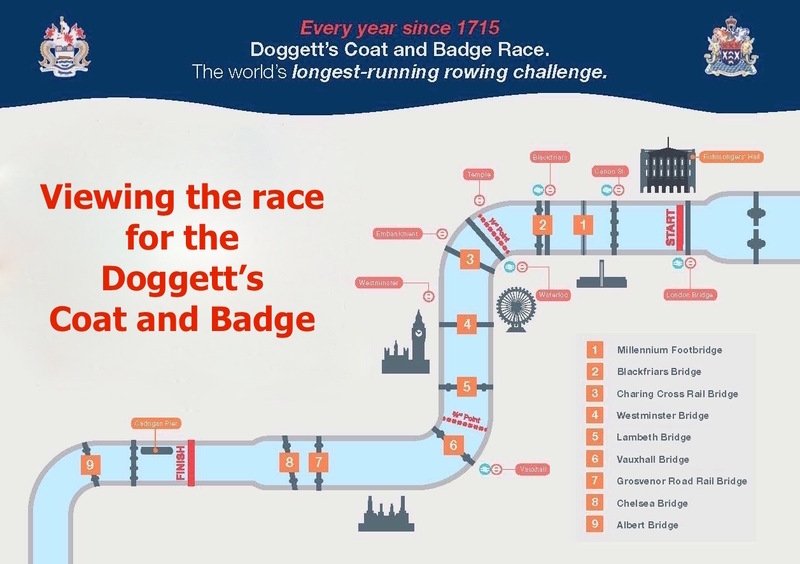 The 304th Doggett’s Coat and Badge Wager, sponsored by Tideway London, starts at 4.00 at London Bridge and should finish less than 30 minutes later at Cadogan Pier, Chelsea. Due to building work at Fishmongers’ Hall, this year the presentation to the winner will be held on Cadogan Pier. I hesitate to pour cold water on your description of the Doggett’s as the “Oldest Boat Race” but unfortunately there is a race which is actually 10 times older than it and indeed, twice as old as the ancient Olympics. The Festival of Oars on the Nile commemorates the races held in Luxor, or Thebes as it was known, when the Pharaoh died. The winning oarsmen had the honour of transporting the body of the Pharaoh from the west to the east bank of the Nile for burial in the Valley of the Kings. Rumour had it that some of the races may have been an aquatic version of a slow bicycle race as it is again, rumoured, that the winning boatman was buried with the Pharaoh! Whether that was alive or dead we do not know. I had the honour of participating in the 1979 single sculls race in Luxor which had an added layer of danger in addition to the bilharzia in the Nile waters when the Canadian sculler from Vancouver and myself began to challenge the local hero sculler. This apparently attracted the disfavour of the local fans which became known to me by the splashes around me from the stones being thrown at us. This drama developed further as the local heavily armed police charged these miscreant fans and proceded to hit them with the butts of their Kalashnikovs! I’m sure this would never happen at the Doggett’s! Perhaps it should now be described as the Oldest Continuous Boat Race. I hate to pour even colder water on your comments, but I actually wrote that Doggett’s is ”The world’s oldest existing continuously run rowing race”. 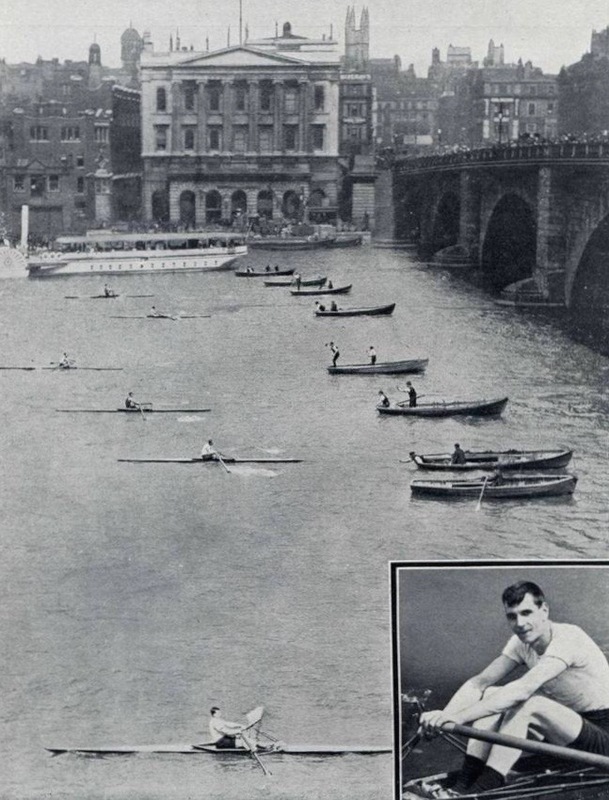 However, this is not a very snappy title and, in any case, I think that ”The World’s Oldest Boat Race”, implies that it refers to an existing event. The Tourist Board were more inspired by Hollywood than Herodotus and claimed that the event originated with ancient oarsmen racing to transport dead Pharaohs. However, there is no evidence that this ever happened (let me know if you have a respectable reference indicating otherwise). I’m no Egyptian expert (but)…. I am not aware of any evidence for racing, although there were certainly processions of paddled and oared vessels at Alexandria and on the Nile both in the Pharaonic and the Hellenistic periods. Having said that, given that there were certainly lots of human-powered boats around on the Nile for several millennia, it’s hard to imagine that there would not have been at least some informal or ad hoc racing, so the Egyptian Tourist Board was perhaps only bending the known facts slightly.